Great value for marine water sport in Bali where you can ride a banana boat, see Bali from the sky by parasailing, and explore a fast ride on the sea with Jet Ski. You will be picked up in the lobby of your hotel (covered area: Kuta, Legian, Seminyak, Nusa Dua, Jimbaran, Sanur ) then drive to Tanjung Benoa, which is a center of water sport activity in Bali. Upon your arrival, you will get brief instructions then the fun begins. 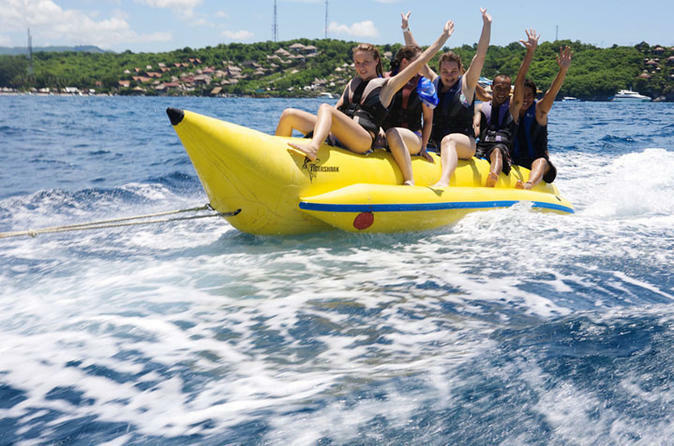 You will start the tour by riding a banana boat, followed by seeing Bali from the sky by parasailing and then enjoying a fast ride in the sea by jet ski. After these fun marine water activities, you can choose additional activities at your own expense, or take the included transfer back to your hotel in Bali.